by Rob - December 26th, 2014. For me, 2014 was a bittersweet year, with the loss of dear friends Colin Edmond, 19, and Michael Lennick, 61, both way too young. It was also the year we moved my parents out of the home I grew up in and closed up the house. Writing the commissioned feature-film screenplay adaptation (drafts one and two) of my novel Triggers for Copperheart Entertainment, Toronto, for a projected $50-million motion picture. Having the paperback of Red Planet Blues released in April. Having Calculating God hit #1 on the Audible.com Science Fiction Bestsellers’ List for the month of April. Receiving the Edward E. Smith Memorial Award (“the Skylark”) from the New England Science Fiction Association in February (presented annually since 1966 to a person who “has contributed significantly to science fiction, both through work in the field and by exemplifying the personal qualities which made the late `Doc’ Smith well-loved by those who knew him”). 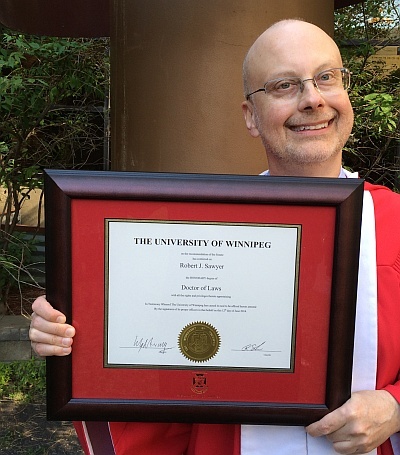 Receiving an honorary doctorate (my second) from the University of Winnipeg in June (LL.D. [Doctor Legum, Doctor of Laws], honoris causa), with the doctorate jointly sponsored by the Dean of Science and the past Dean of Theology. 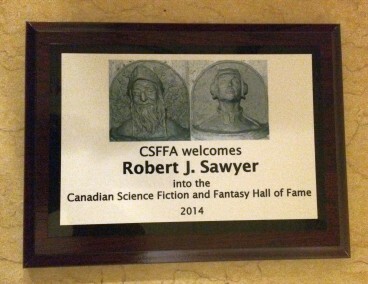 Being one of the nine initial inductees into the Canadian Science Fiction and Fantasy Hall of Fame in October. Being long-listed for Retail Council of Canada’s / Canadian Booksellers Association’s Lifetime Achievement Libris Award in March. Having the Mississauga Public Library host the day-long Mississauga Science Fiction Spectacular in my honour in October, with me giving the keynote and featuring my dream team of friends and colleagues speaking: Marie Bilodeau, Tanya Huff, and Robert Charles Wilson. George M. Ewing Canandaigua Forum, Canandaigua, New York, in November. Debating the president of the American Civil Liberties Union about privacy at the St. Gallen Symposium in Switzerland in May. Being a featured guest at the Toronto Public Library’s Book Lover’s Ball in February and at Dragon Con in Atlanta in September. And my short story “The Stanley Cup Caper” featured in store-front posters citywide in Moose Jaw, Saskatchewan, as part of Reading Town Canada in May. Having my short story “Ours to Discover” used as the Spring 2014 state-wide reading-comprehension test by the Pennsylvania System of School Assessment. Attending the concluding session of the four-week close-reading study of my novel Calculating God at Seneca College at York University in March. Hosting the 30th-anniversary reunion party for Hydra North, Canada’s first association for science fiction professionals, in May. Attending writing retreats in Canmore, Alberta; in Calgary, Alberta; and three times in Winnipeg, Manitoba; and hosting one in Mississauga, Ontario. And, of course, working on my twenty-third novel, which will be published in April 2016.